This is my recap of an episode that I feel has finally gotten back to the root of what makes it good and watchable. The interaction between Gao Zhan and Lu Zhen. Lu Zhen is trying to survive to the best of her abilities. Gao Zhan provides to be someone who supports her instead of smother her. Lu Zhen wakes up in Teacher Yang’s room. There is a certain good rapport between teacher and student. And Teacher Yang asks Lu Zhen for the whole truth, why is her past so mysterious? Lu Zhen decides to trust her and tells her everything. 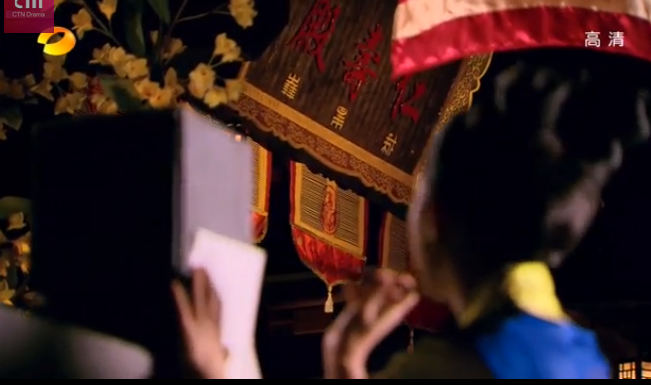 To avenge her father, Lu Zhen wants to become a Female Official and reopen her case. Teacher Yang tells her that it is very difficult to become one. 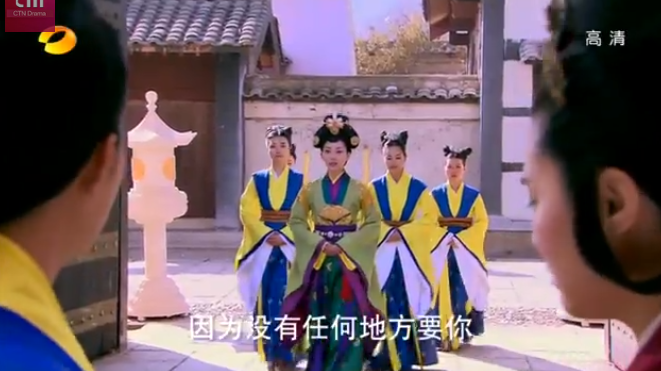 First she has to rise through the 4 levels of palace maids, and take the test for female officials. The test’s very hard, any 1st grade maid could take it but it’s like a horde of people trying to cross a single beam bridge It normally takes 3 to 5 years. Lu Zhen says that it’s too long. 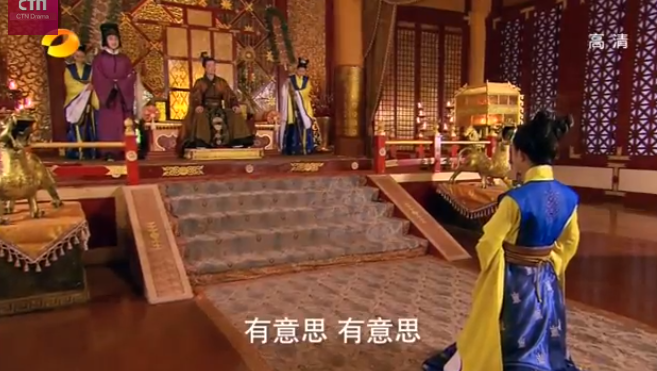 Teacher Yang tells her that it’s women’s fate to wait for thing to come to them, look at the royal concubine Xiao, she was a Princess in her country, trained to be Queen but because her own country fell and she is in disfavor with the dowager, she now is only a royal concubine. Lu Zhen says that while Teacher Yang makes sense, Lu Zhen believes that she can’t just let others dictate her every move. Lu Zhen returns to the trainee maid’s place, and while she has people who like her and defends her in front of A Bi, who everyone knows told on Lu Zhen, A Bi has supporters as well. Lu Zhen shows that she won’t let A Bi walk all over her when A Bi tries to strike on the other girls who tells her that if A Bi dies, no of them will burn paper money for her. 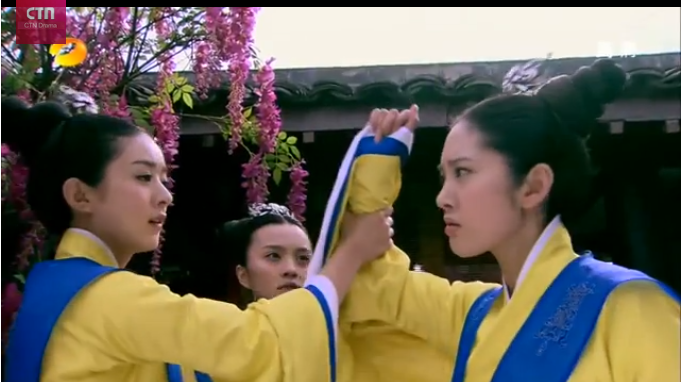 Lu Zhen stops A Bi from hitting the other girl. In ten days time, the trainees will be graduating and for their test they have to make a birthday present for the Dowager’s 60th (a very special present). They will be divided into groups by how they are housed. A Bi suggests that they make a jacket to her group and they reply that doesn’t seem too special. A Bi holds out a bag of priceless pearls and all the girls are in awe at the quality. She smirks, sure that she will win. Lu Zhen on the other hand, hears of A Bi’s idea and isn’t worried like the other maids are. She says that the Dowagers have seen all sorts of priceless baubles, they need something original, something that hasn’t been created before. That being said, she gets the idea to make a silk tent embroidered with hundred different characters from other languages that means “luck”. The girls are really excited and prepare the characters. A Bi hears about it and sabotages them by luring them away and taking one of the characters. Lu Zhen and her team discovers that one of the character is missing and the girls search desperately. Lu Zhen surmises that the character must have been taken and that looking for it was no use. She asks if there are any other languages they might have overlooked and the girls shake their heads, but one girl remembers that the Dowager is of the Xian Bei tribe, on her palace awning, there the character for luck is written in Xian Bei character. 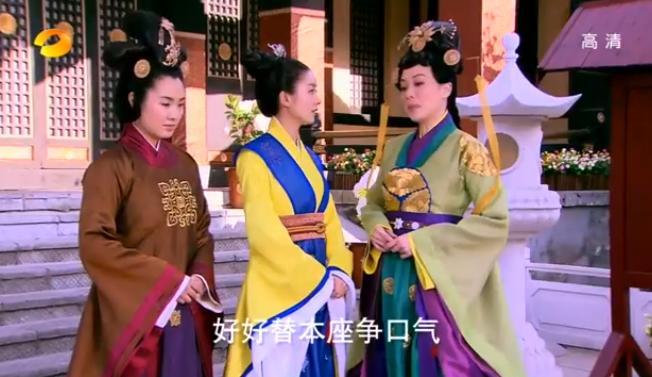 Lu Zhen sneaks into near the Dowager’s palace and tries to copy the character. But she is found by the guards and maids, who mistake her for an assassin for the Emperor. 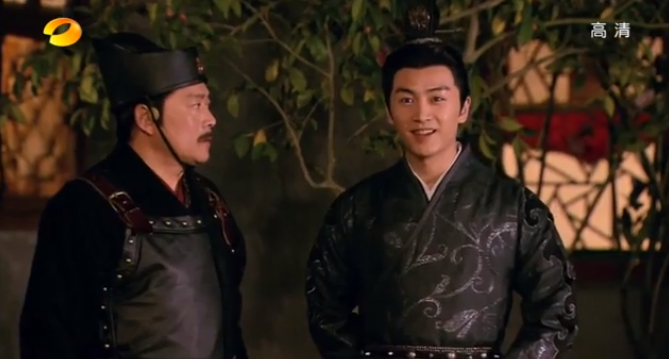 Wang Shang Yi comes to see what the matter is when she sees that it’s Lu Zhen. 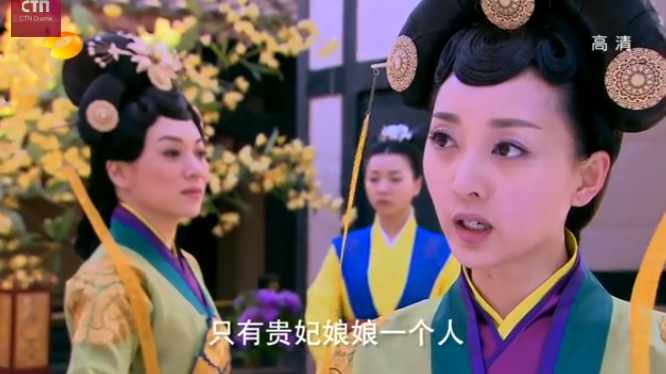 She commands that Lu Zhen shall be beaten to death and thrown out of the palace. At that moment, the Emperor is passing by and stops to see what the matter is. Wang Shang Yi says that Lu Zhen has disturbed the peace, and she is about to be sentenced to death. 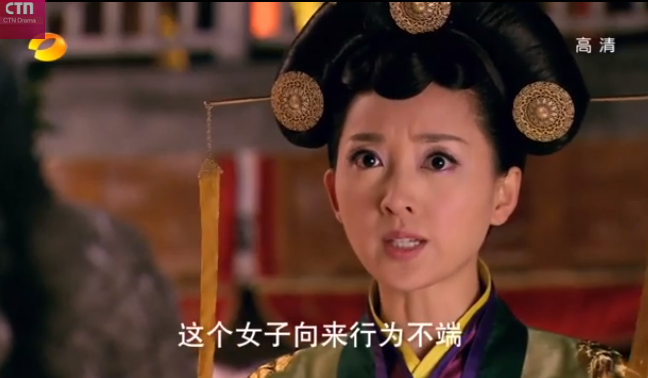 Lu Zhen interrupts and tells the Emperor that she’s actually here to copy a character for the Dowager’s birthday. 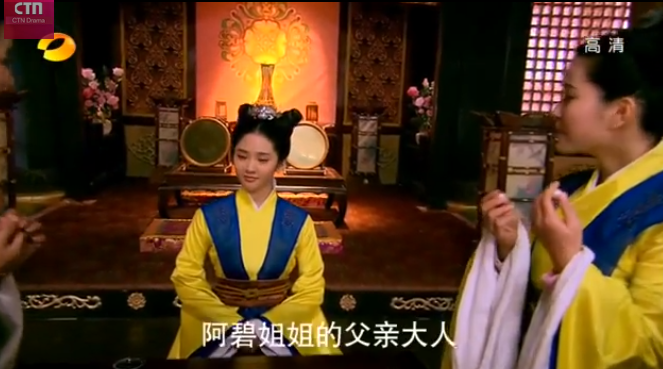 She looks at the emperor who is taken aback by how much she looks like Huan Yun (the Royal Concubine). 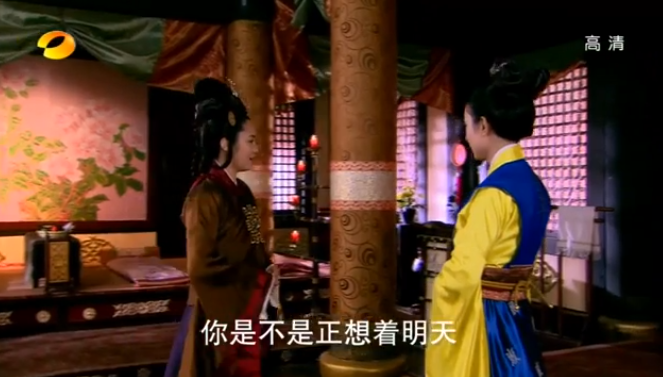 He asks her if she is from the kingdom of Liang where the Royal Concubine is from. Lu Zhen is puzzled and says she’s a Han girl. The emperor remarks on the coincidence. The emperor takes her to his palace and asks her to tell the whole story. When he hears it, he laughs and says that not only does she look like the Royal Concubine, she also acts like her. 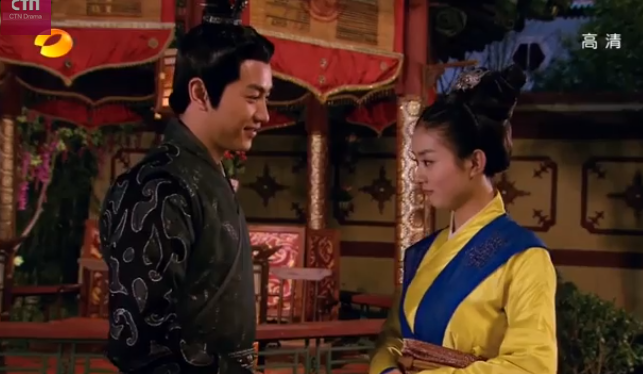 Since Lu Zhen broke palace laws in order to make a present for the Dowager, he’ll forgive her. Then he write the character for her and sends her back to the trainee’s place. 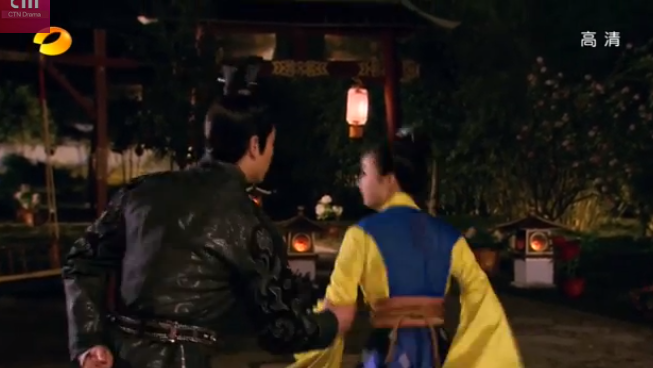 On the way back, Lu Zhen runs into Gao Zhan. 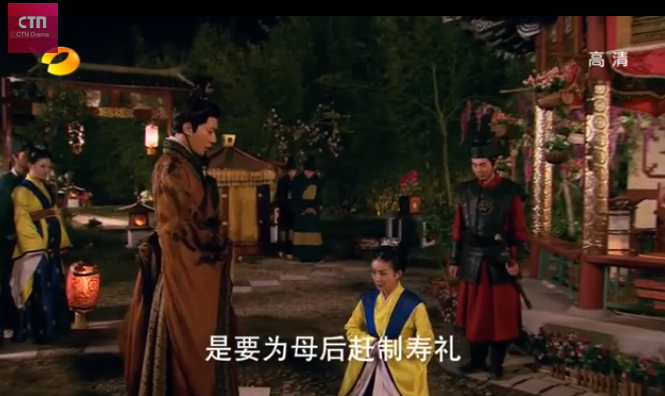 They smile at each other for the cutest moment, Gao Zhan sends his guards away and runs over to talk to her. She asks how he ended up to the palace, how he knew the princess, and how was his wounds. He smiles and says that his stepmom sent him in, his family and the princess are old friends, and he’s all healed. She walks around him and says, by the way you look… are you a palace guard? He quickly agrees that he is, relieved that she doesn’t figure out who he is. The gong rings and Lu Zhen says she’ll be in trouble if anyone finds out she snuck out. He grabs her sleeve and holds her back. He tells her that if she wants, he can arrange some official to adopt her, she can stop working and fight with her stepmother anew. She tells him to don’t even think about it, she’s happy in the palace and she’s going to become a female official. He smiles and says that he won’t stop her. She tries to leave again, and he grabs her sleeve again, like a cute little boy who doesn’t want the girl he likes to leave. He gives her back the jade as she looks at it in astonishment, protesting, but its yours… He tells her, ” You forget what I told you – What is yours, will always be yours” He tells her that whenever he has time, he’ll definitely visit her. 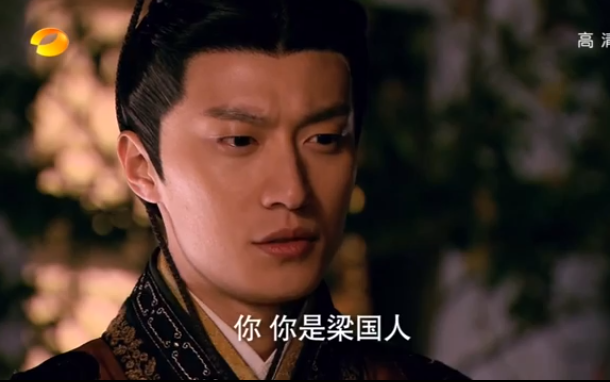 When his guard comes to talk to him, the guard remarks that Lu Zhen really looks like the Royal Concubine, no wonder he likes her. Also, she’s very smart, not many court ladies are like her. Gao Zhan replies, of course, no lily soft lady can even compare with Lu Zhen. 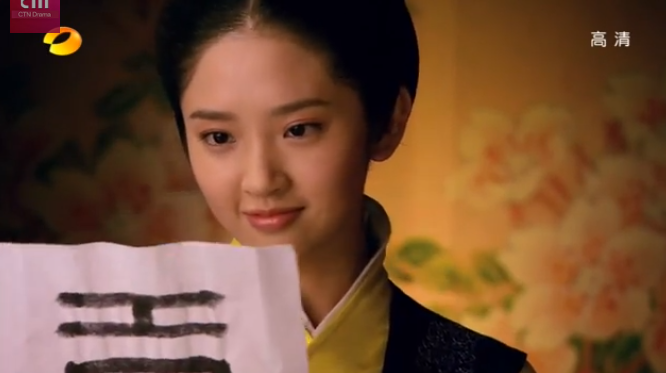 The test results to place the trainee maids into various palaces, and while Lu Zhen had won the competition for the dowager’s gift, she did make the list for placement. Lu Zhen asks why this happened? Where will she be placed? 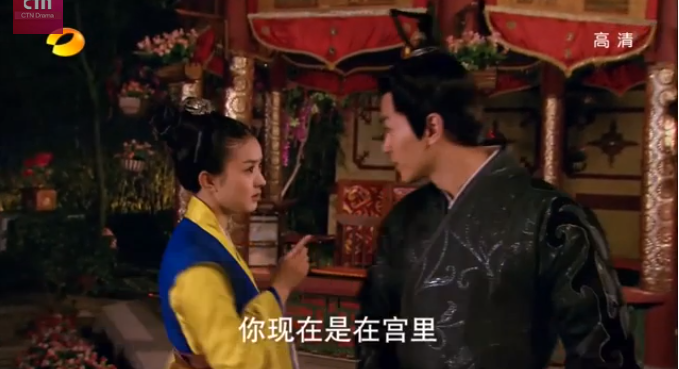 Wang Shang Yi comes and tells her that no palace wants Lu Zhen, after her various infractions no one dares. She must get out of the palace now. 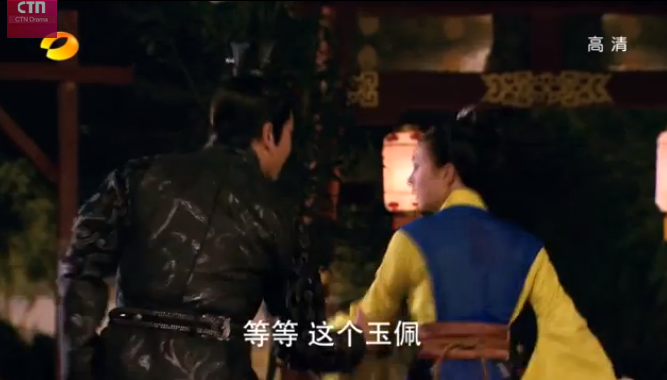 Lou Qing Qiang comes in time to stop Lu Zhen from getting kicked out. 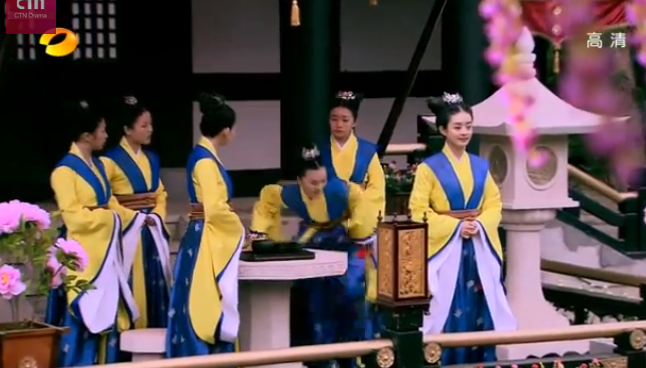 Wang Shang Yi says that she has always been the one in charge with the placement of maids, this falls under the jurisdiction of the Royal Concubine. 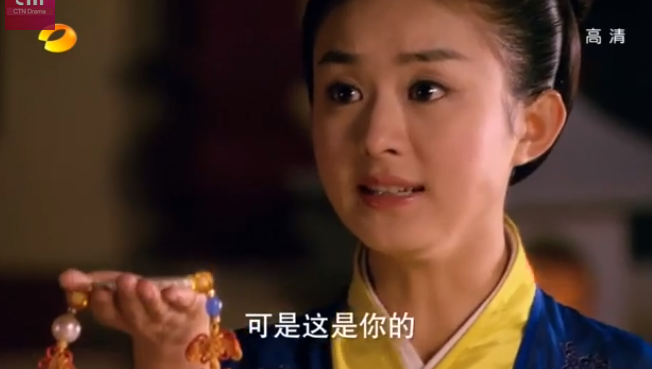 Lou Qing Qiang asks if the Royal concubine is bigger than the Dowager. 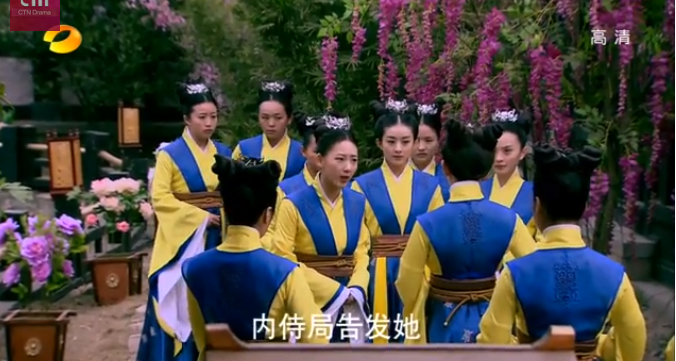 They both send people to their various mistresses to appeal for Lu Zhen’s right to stay in the palace. 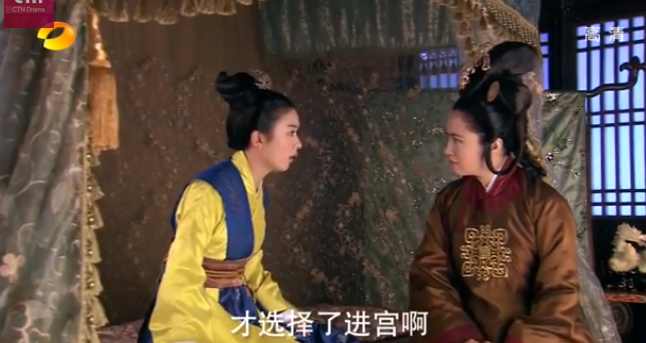 The dowager and Royal Concubine decide that Lu Zhen will meet them tomorrow. Lou Qing Qiang tells Lu Zhen to look her best. While Lu Zhen prepares to be her best, but Teacher Yang comes and tells her that she’s very foolish. Right now she’s a pawn in the game, and it’s because she looks like the Royal Concubine. If she goes to the audience , and the Royal Concubine sees Lu Zhen, then Lu Zhen will die. The Royal Concubine hates women who try to gain the affection of the Emperor. If the emperor really likes her, the she would only end up as a bed warmer. Only women who come from the higher classes can become concubines, Lu Zhen will languish in the palace for the rest of her days. In Many ways, Gao Zhan is as unique as Lu Zhen. He’s one of the few male characters who gives the female the right to choose how she should live. Not only is this against the grain in ancient times, but its still hard for some modern men. I get the feeling that Lu Zhen genuinely cares for him but he’s already starting to move from the crush phase to full blown love.